With environmental issues such as Global Warming, pollution we, as a nation should be more focused on finding natural ways to live, even when it comes to decorating our homes. From exterior building materials to interior paints, fabrics and fixtures, most people are starting to think ‘green’ before selecting products. I have always emphasized on recycled products and beleive in GO GREEN ideas. This time I have decided to use Terracotta for decor which is again a natural product. Terracotta is clay based unglazed ceramic. Terracotta is timeless material, which is derived from nature. It is there since the beginning of time and will forever have a place in great design both indoors and outdoors. Terracotta gives a very natural and ethnic look for Indian decor. Keen sense of aesthetics will help you incorporate these items in your daily life. 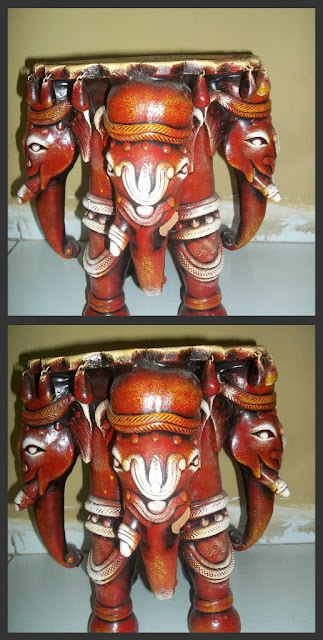 Terracotta is not entirely an Indian art form but is found in many other countries. 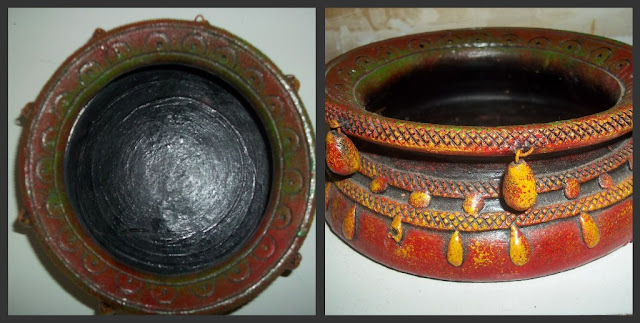 A colourful terracotta bowl to place floating candles/flowers etc. Bright and contrasting colours give it a gaiety of appearance. Flowers floating in a terracotta bowl bring smile on everyones face and fragrance in the air, simple ways in which we could bring terracotta art into our homes. I have used fascinating arrangement of dried flowers. Terracotta items are breakable. One needs to ensure that they are not dropped or they will break. Clean with cotton cloth. this is such an interesting and beautiful table Sarika!! !